One of the benefits of having a vibrant food and drink culture in Boulder is the opportunity to sample some of the best artisanal products from around the world. After all, when a rare product is created, it will only find its way via our modern day spice traders to those epicenters of gastronomy where tastemakers congregate in sufficient number to constitute a viable market. Imagine the bustling scenes in centuries past in Byzantium, Goa, or Beirut, where family cooks hustled through open air markets, their sacks laden with treasures from across the seas. Without those hustling mamas, the spice ships would move on. Such a place has Boulder become, thanks to an interested (and affluent) populace, and an ecosystem of committed importers, restauranteurs and retailers, who regularly introduce special products for your discovery. 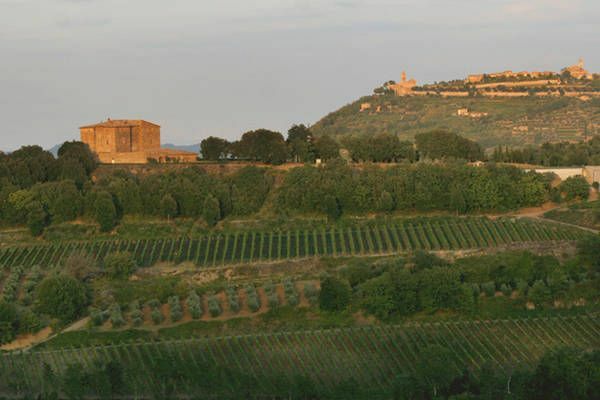 I was recently invited to a stellar event that allowed me to witness this ecosystem in action: a tasting of rare Brunellos di Montalcino provided by Vinifera Importers, co-hosted by Arugula Restaurant and Hazel’s Beverage World. It was 6:00pm on a lazy Tuesday, the late afternoon spring rains had begun, and magic was in the house. The event brought together a few interesting characters — some local, others from farther afield — who were spreading the gospel of one of the world’s greatest wines. Vinifera was represented by Anna Clare Monlezun, who entertainingly relayed to us the stories of the Tuscan winemakers whose fare we sampled: Sandro Chia, who re-built a castle in 1984 to house his wine operations; Olga Peluso Centolani, one of the pioneering women in the Montalcino wine world; and Vincenzo Abbruzzese, whose reputed perfectionism has guided Valdicava Vineyard to produce a slew of top-rated vintages since 1968 (several have been awarded 100 points). Valdicava individually numbers every cork, so in the event a bottle is off, Vincenzo can personally track it back through the production process to find the problem. The bottles we sampled were not off. They were, in fact, among the best wines I have ever tasted, anywhere. 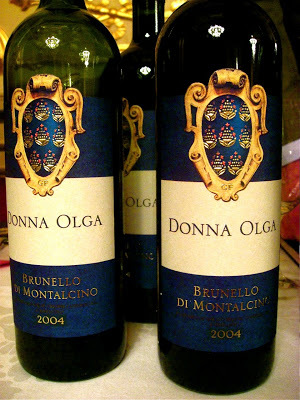 The Brunello is developed from 100% Sangiovese grapes, and aged at least three years according to strict standards, typically in Slavonian oak casks. (Not Slovakian, or Slovenian…. Slavonian!). These casks impart little oak flavor, which is sure to please certain people, and in any case the flavors are so entirely well-blended, there is no difficulty or struggle to be found. Only pure pleasure. It is a confident, decidedly old world wine, mature in profile, deep, mellow and delicious. Although Chef Schuler provided a nice plate of antipasti to discipline the tastes, by the time we reached the final two bottles, I had no desire for any interloping pecorino or prosciutto to interfere with the magical Brunello. OK, I’ve gone a bit overboard, but the Brunello is a world-class wine, and these are fantastic, small batch examples of the art. I’ve listed the exact vintages we tasted below. In general, I enjoyed the wines progressively more as we climbed the cost ladder, which is not surprising. That said, the ’07 Valdicava and ’06 Riserva were both sublime, and I would take advantage of the lower price on the former. Well… would that I could. I’m in no position to regularly shell out the shekels these wines deservedly ask. But as Anna Clare helpfully suggested, since the Brunello typically improves with age, (indeed it was one of the first wines designed especially to improve with age), they make for a great anniversary celebration. That is, buy a vintage from the year your child was born, or your wedding year, and crack it open on a suitable milestone a few decades down the road. The lesser Brunellos (that’s like saying a “lesser thoroughbred”) might serve a similar purpose once or twice a year. The Donna Olga was especially delightful. Back to the event: Alec (whom we interviewed in depth a while back) is a great guy. He’s unpretentious, generous, self-effacing and funny. 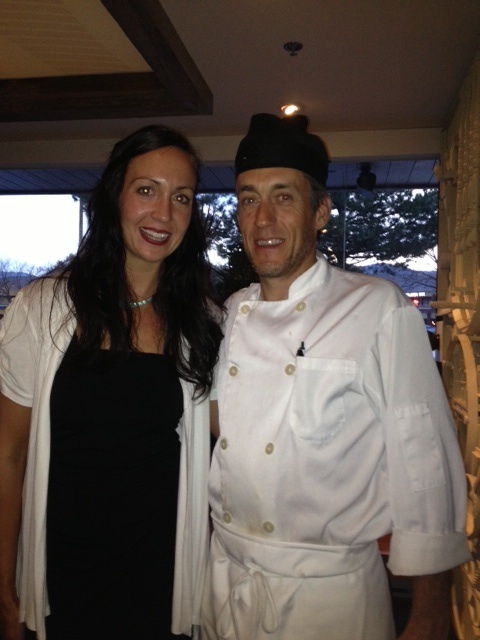 He opened his wine bar Amaro for this event, and had it sparkling when the pouring began. His nosh platter provided familiar northern Italian satisfactions, with one wild card in the form of German Cambozola. (Despite what I said above, I ate the whole plate, not to mention a second one he beckoned over later.) Alec puts together his own wine list from 10 different distributors, Vinifera included, picking and choosing vintages that match his cuisine. 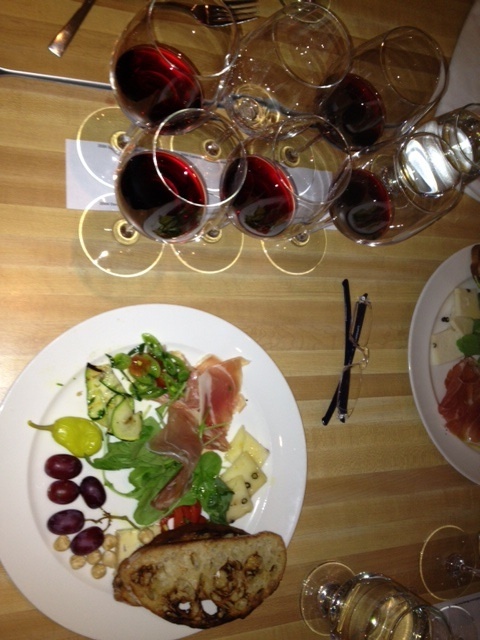 A six pack of ambrosia, with platter, at Arugula's Brunello tasting. Judging by Anna Clare’s professionalism and the stupendous quality of the products, Vinifera is a top-notch operation, run with smarts, discernment and class. They are the oldest importer of aged Italian wines in the U.S. and the only one in Colorado that cellars product, making older vintages available beyond their initial distribution timeframes. Mind you, the wines we tasted here are of such rarity that only 250 (Castello Romitorio) to 800 (Tenuta Friggiali) cases annually make it to the US at all. This is another reason to attend a tasting event thrown by Vinifera: you’re likely to enjoy some extremely rare, perhaps once in a lifetime, bottles. But for most of us, the Tuscan heyday was a long time ago in a galaxy far, far away. In most respects, that’s rightly so. (Dante’s Hell is steeped in intra-Tuscan atrocities.) Yet, many of the signature agricultural products of the region possess an amazing balance and joy that cannot be denied, and Brunello is one. Where and when they arrive on our shores are worth noting, seeking out, and exploring, if you are so inclined. Sandro Chia paints his own custom labels. This one is wicked! Due to our globalized spice trade, you can now find some of these great library vintages in Boulder. Restaurants include Frasca, Ristorante L, Flagstaff House, Black Cat, The Melting Pot, Zucca, Bacco, and Jax Fish House. Retailers include Hazel’s, Boulder Wine Merchant, Bottles, North Boulder Liquors, Union Jack, Tenacity Wine Shop, Hover Crossing, and Liquor Mart. And if you are into the awards thing, a Vinifera wine was just picked by the corporate office of Whole Foods Wine and Spirits as one of their Top 10 of 2013. (Anna Clare was coy on the specifics. They will release the list later this month.) Upcoming Vinifera wine dinners this summer will take place at Ristorante L, the Melting Pot, and Praha Restaurant. I encourage you to keep your ears open for these events, subscribe to localwineevents.com, and/or check the EDB calendar. Disclaimer: I was provided a press pass to this event. My companion paid the full $49 fee. Great summary! Sounds like a splendid tasting event. I’ve had Brunellos at numerous tastings before, but I think they have all been many years too young, so I can’t honestly say whether or not I like them. Thanks Beau. Aging may have been the problem, or even just time to breathe. Apparently you can pop one of these guys in the morning and not drink it til night! Paul, you deliver the whole package (laden sack?) here: fun to read, informative, and generous. Your links are a lesson in themselves. 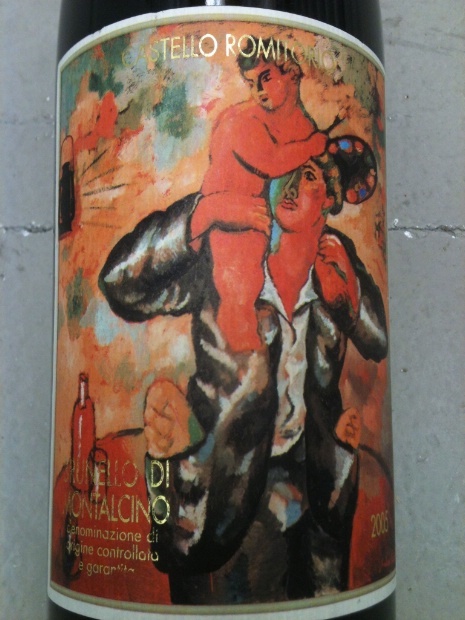 And please let us know if you do run across a lights-out, inexpensive Rosso! Thanks Allan. And back atcha on the Rosso. I think it’s all about context, so I just need to devote a night to a Rosso sans Brunello. I’ve had the same experience with Sagrantino Rosso, by the way. Previous Previous post: Come for the Burritos, Stay for the Margs?